So. Round four. 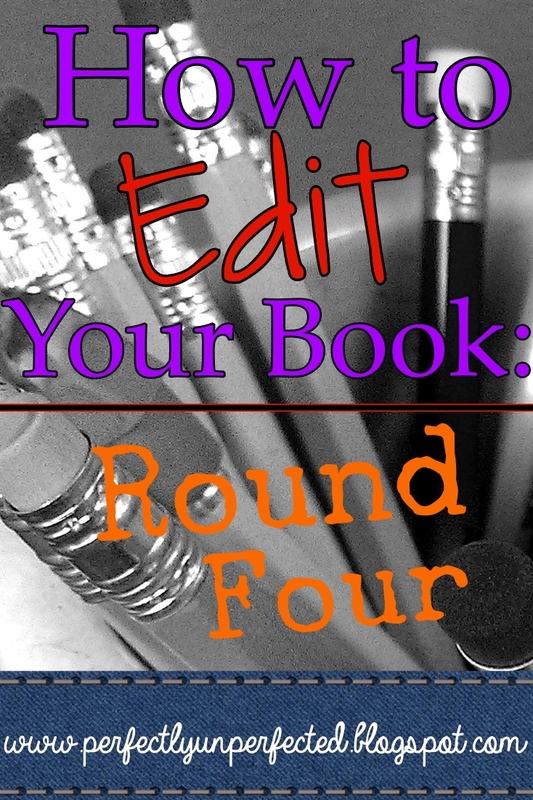 Unlike the other rounds of editing, I don't usually focus on specific things in round four. Instead, I like to go back and read through the entire draft again without editing. If I find myself editing in my head, I know I need to do another draft. To give you an idea, here are some of the things I like to keep in mind when I go through round four. Look for things to tighten: Wordy sentences and paragraphs, unnecessary dialogue, and extra words are just a few examples of things that could be tightened up in round four. Just because we focused on these things in previous rounds does not necessarily mean you've gotten everything, so keep an eye out! Look for telling and not showing: When reading through your draft again, are there any scenes or chapters where you tend to tell the audience things rather than show them? It took me a lot of rounds of editing before I was able to really find a lot of spots where I was telling instead of showing. Practice makes perfect: Don't get discouraged if you've been editing for a while and it still feels like your book is nowhere near done. It's okay! Some books need to be edited over and over again in order to be shaped and polished. As you keep editing, you'll get better at finding mistakes as well as rewriting. Don't be afraid to scrap and rewrite: This is probably one of the hardest things I've ever dealt with. For a long time, I kept trying to edit Unperfected over and over, hoping it would make it what I wanted. But in reality, I needed to rewrite the whole book and change the plot around a little. It was hard to accept, but I had to do it--and now I couldn't be happier! So don't be scared if you feel like you need to rewrite. Yes, it's a lot of work, but that's writing. It comes with this job. Just take a leap of faith and see where it takes you! After round four, repeat, repeat, repeat! Your next rounds of editing are just repeats of these last four rounds until your book is done. You might only need four rounds. You might need ten. You might even be like me, and go through so many rounds you've lost count! However many rounds you go through, just remember to not let yourself be blinded by perfection. Focus on making your book the best it can be--not perfect and flawless. Editing can be tough, but it's necessary. So don't stress about it! Just take things on round at a time. Soon enough, you'll have a polished book all ready and sparkling.